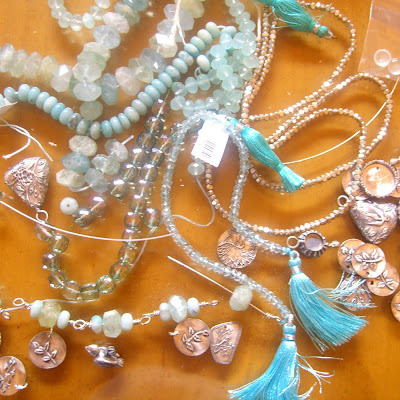 Vickie Hallmark jewelry design Vickie Hallmark: What's On Your Worktable? I'm buried under here, trying to finish up last minute projects. Here's a portion of my worktable, the scenic portion that caught my eye with it's gorgeous wash of aqua. Silver nuggets, aquamarine, chalcedony, amazonite, silver charms, earring bezels, birds and more birds. What's on your worktable? Feel free to zoom in on the scenic part. My workspace is EMPTY! Boo hoo. But i am happy to say that we arrived in Tucson Friday night. We were on the road since June 24th. So now we wait for the stuff to arrive.